Twelve years ago today, at exactly 5:11am, I gave birth to a beautiful baby boy. I have loved him every moment of every day since he was born. Yes, of course there are days when he drives me crazy with his non-stop, inquisitive and thought provoking questions, but it’s these little things that make him uniquely wonderful. He lives in my heart and is carried with me everywhere I go and in everything I do. He makes me smile every time I think of him, has made me a better person, and I am so very proud that he calls me mama. He has grown into an incredible kid who has an absolutely brilliant mind, a kind spirit that surrounds you and huge, loving heart. For my one and only, I created this special treat sprinkled with all of his favorites — creamy milk chocolate, gooey marshmallows and a hint of crunchy toffee bits! Preheat oven to 350 degrees. Prepare an 8-inch-square baking pan with cooking spray. Line bottom with parchment paper, leaving an overhang on two sides; and spray paper with cooking spray and set aside. In a heatproof bowl set over a saucepan of simmering water (or you can use a double boiler), add butter and 1 cup chocolate chips. Heat, stirring occasionally, just until melted, about 5 minutes. Remove mixture from heat; stir in sugar and salt, then add eggs and stir gently. Add flour and mix until just combined, then fold in 1 cup of Heath bits. Spread batter evenly in prepared pan. Bake until a toothpick inserted in center comes out with moist crumbs attached, about 35-40 minutes. Remove from the oven, and immediately sprinkle with remaining chocolate chips, then marshmallows and top with the remaining ½ cup of Heath bits. 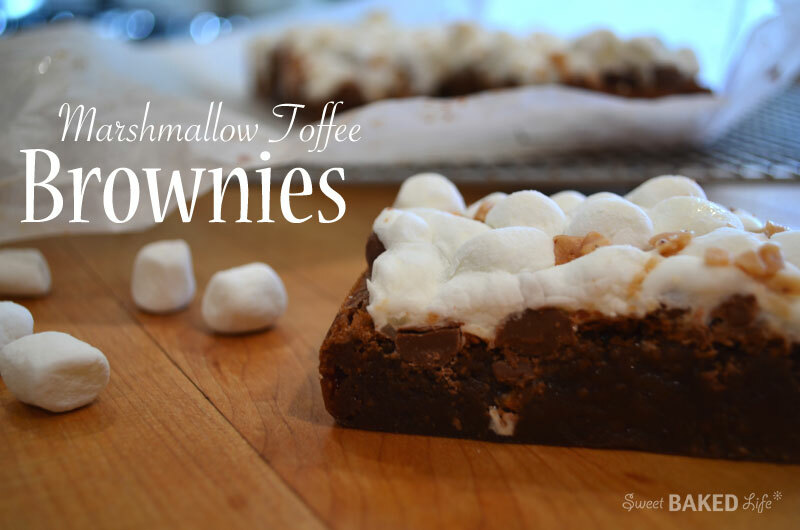 Bake until chocolate is shiny and marshmallows are puffed, about 5-8 minutes. Cool completely in pan. Using paper overhang, lift cake onto a work surface; cut into 16 squares. happy birthday to your baby boy 🙂 These brownies look awesome. Mmmm, these look really delicious! Oh Miss Sweet Nothings…they are! You’ve got to give them a try!